The U.S. National Under-18 Team continues play in the 2018 Under-18 Five Nations Tournament against tournament-host Czech Republic at 7 p.m./1 p.m. (local/ET) at Buly Aréna. The U18s will play four games in a span of five days. The Czech Republic is coming off a 5-1 victory against Switzerland on Wednesday and sits tied atop the leaderboard with the U.S. after the first day. Ondrej Psenicka recorded three assists while goaltender Lukas Parik made 20 saves on 21 shots to lead the Czech Republic to victory. The U.S. and the Czech Republic met four times in the 2017-18 season of international play, and Team USA emerged victorious in three of the four games. The Under-17 Team met Sweden for the first time on Nov. 5, 2017 for the U17 Challenge preliminary round and won 5-2. Jack Hughes (Orlando, Fla.) scored twice and added an assist to earn the U.S. Player of the Game honors while Spencer Knight (Darien, Conn.) made 20 saves to earn the win. The current U.S. National Under-18 Team met Czech Republic a second time during the final matchup of the Under-17 Five Nations tournament in Jarvenpaa, Finland, and recorded an 8-3 win to remain undefeated in international play and to capture first-place. Cole Caufield (Stevens Point, Wis.) recorded four points (2-2-4) while Alex Turcotte (Island Lake, Ill.) and Cam York (Anaheim Hills, Calif.) added three helpers each to help lead Team USA to victory. 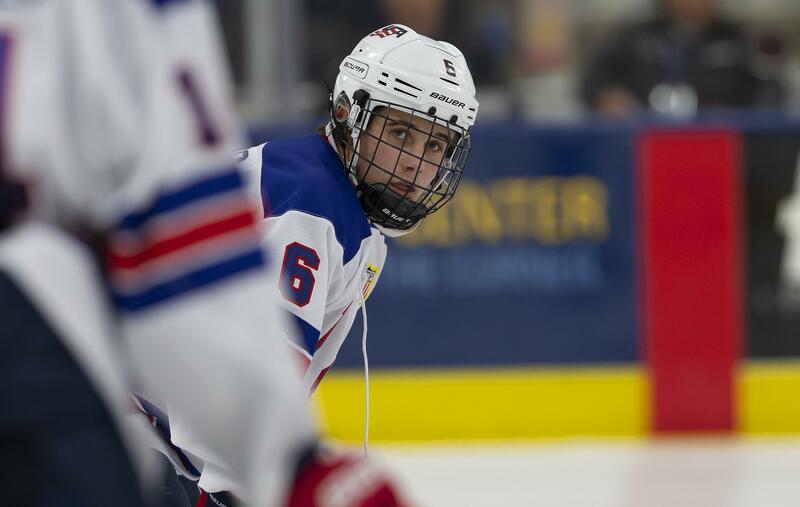 John Beecher (Elmira, N.Y.), Cole Caufield (Stevens Point, Wis.), Michael Gildon (Plano, Texas) and Jack Hughes (Orlando, Fla.) each tallied two goals for the U.S. National Under-18 Team in its 8-2 victory against Sweden in the opening game of the Under-18 Five Nations Tournament on Wednesday afternoon at Buly Arena. 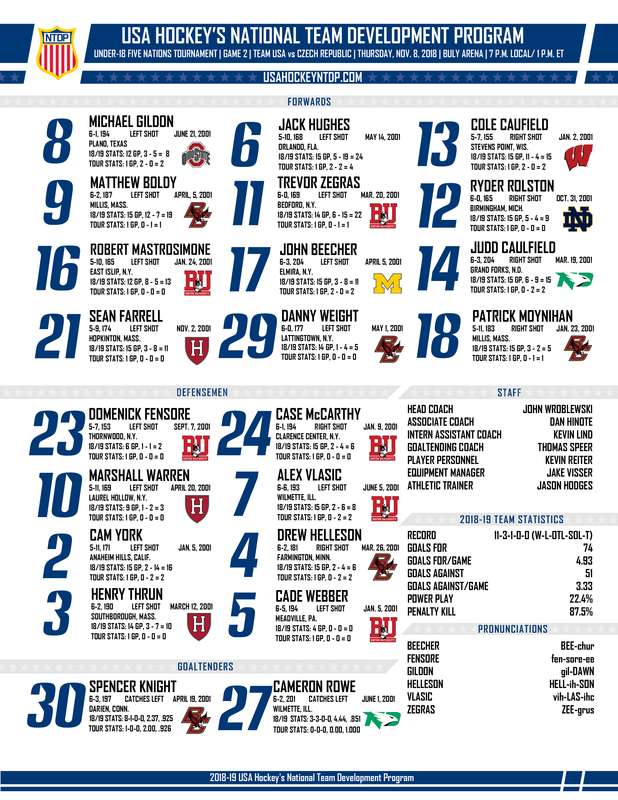 Hughes along with fellow forward Judd Caulfield (Grand Forks, N.D.) also drew two assists in the game. Defensemen Drew Helleson (Farmington, Minn.) and Alex Vlasic (Wilmette, Ill.) and Cam York (Anaheim Hills, Calif.) also contributed two assists each. Matthew Boldy (Millis, Mass. ), Trevor Zegras (Bedford, N.Y.) and Patrick Moynihan (Millis, Mass.) also added helpers in the game. Goaltender Spencer Knight (Darien, Conn.) played the entire game for the U18s, stopping 25-of-27 shots to earn his first international victory of the season. With the victory, Team USA head coach John Wroblewski (Neenah, Wis.) has now led the U.S. to victory in 30 straight international competitions.